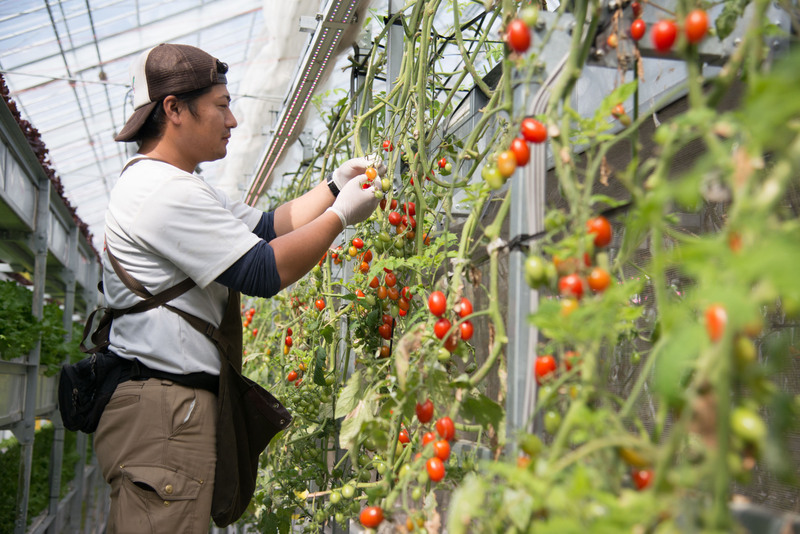 Apure Inc. in Hokkaido grows 28 varieties of chemical-free vegetables at its facility. Weather and temperature are not an issue because everything is planted inside two greenhouses. Apure’s vegetables do not even need soil to grow as they are cultivated hydroponically. What makes Apure a leading-edge company in the agricultural industry is its simple, yet logical and insightful method of using the same nutrient solution for all the vegetables they grow. Typically, the kinds of nutrients vegetables require vary depending on the vegetable type; this is why monoculture has been the mainstream method of farming. In monoculture farming, farmers try to choose a suitable fertilizer and make a seemingly perfect environment for the particular crop they are growing. However, Apure President Hirosuke Takahashi asserted that it is a very human-centric idea to think that humans need to provide plants with what they seemingly need in terms of nutrition. “Plants take whatever is necessary for them and leave the rest for other kinds of plants to absorb,” he said. That is how a natural ecosystem is maintained. Different plants can coexist because each of them consumes different nutrient mixtures. A beneficial balance is maintained by diversity. Takahashi calls it the “Zokibayashi theory” (“Natural woodland theory”). “Artificial forests consisting of only one kind of tree suffer from periodical diebacks. All of the trees fight over the same nutrients, causing imbalances in the bacterial composition of the soil. The degraded soil becomes too weak to support all the trees,” he explained. Natural forests never have this problem because they are able to maintain their own balances. Takahashi introduced this theory into agriculture to put an end to the constant fight against soil deterioration in monoculture. In his greenhouses, vegetables of different varieties grow side by side, absorbing necessary nutrients from a common nutrient solution shared among all the vegetables. While monoculture farming tends to deluge crops with excessive nutrients, Apure’s vegetables use their full potential to fight for what they need, making themselves stronger and possibly tastier. “Our technology is efficient, too. 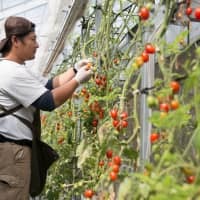 Our model is already 40 times more efficient than ground farming because vegetables can grow in shorter cycles in smaller spaces,” Takahashi said. 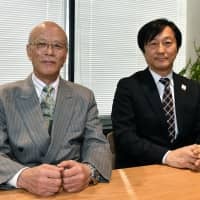 Supporting his ambition to raise the efficiency even higher is the technology provided by NTT Docomo Inc. through Corevo, NTT Group’s initiatives to utilize artificial intelligence. There is all kinds of information such as temperature, moisture, amount of carbon dioxide, component balance of the nutrient solution and visual images of the vegetables in the greenhouses that can be useful if collected, analyzed and archived effectively. 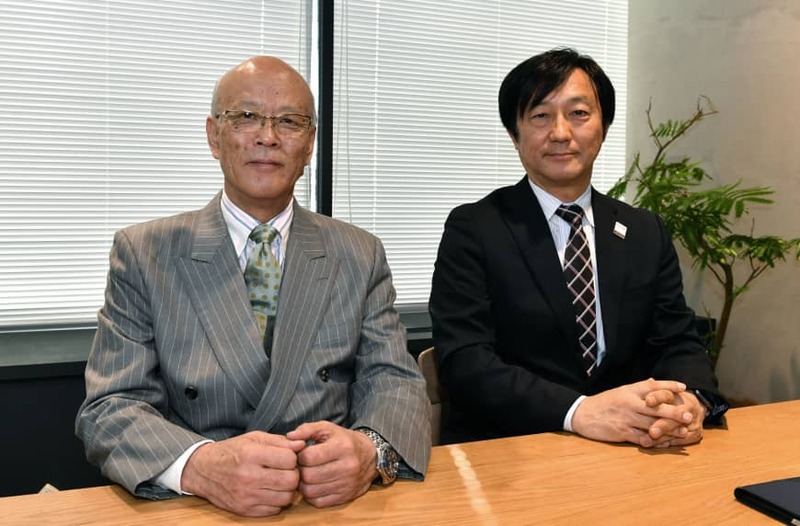 NTT Docomo’s Corporate Sales and Marketing Department Executive Director Masamichi Endou explained that their AI technology does exactly that to improve efficiency and make the farming process more independent from experienced experts’ instincts. 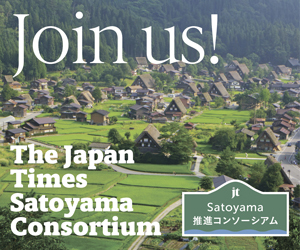 “One of my missions is to contribute to the revitalization of rural areas in Japan by creating jobs. Opening the door to agriculture and making it easier for anyone to start is one of the ways to achieve this goal,” Takahashi said. Apure is also looking at the global market by way of not only selling their vegetables abroad, something they already achieved in Hong Kong, but also distributing the whole hydroponic system. They have an optimistic outlook because of one of the most unique features of their system; Apure’s hydroponic system is totally circular without any waste solution. According to Takahashi, there has not been a drop of discharged used nutrient solution since the greenhouses started operation almost four years ago because the diverse produce grown together help the solution clean itself for reuse. “In some parts of the world, including the U.S. and Europe, the discharge of waste hydroponic solution is strictly regulated. Many farms could save the costs involved in building water purification facilities if they use our system,” Takahashi said. As the first step of their endeavor to the world, Apure and NTT Group will be presenting their achievements in the Smart Agriculture section of the MWC Barcelona, an international exhibition on mobile technologies, to be held in the Spanish city from Feb. 25 to 28. “Japan does not have any regulations on waste hydroponic solutions yet, but there are talks among lawmakers that such a regulation should be in place,” Takahashi said. He also noted that agricultural drainage is the main source of water pollution that accounts for 67 percent of the total wastewater in Japan. Apure’s hydroponic system has the potential to reduce the environmental impact of agriculture both in Japan and abroad.